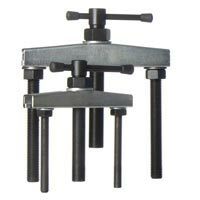 Patented self-centering 3-arm pullers (mechanical and hydraulic) for diameter Ø40 mm till Ø640 mm. 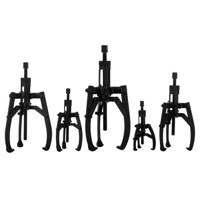 The 3 arms of these pullers adjust themselves simultaneously and symmetrically, inwards or outwards. There is no possibility of the arms bending or deflecting. 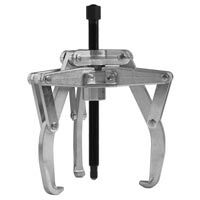 Hydraulic screws with a 20 ton capacity are available for use in combination with the two largest pullers. 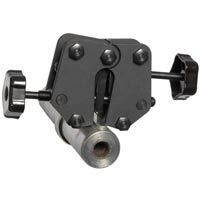 The thread of the screws is in no way affected by the building up of hydraulic pressure, thus keeping wear and tear to the screws down to a minimum. 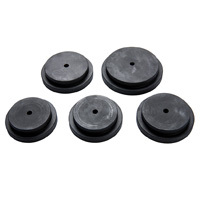 * These types may be converted into hydraulic tools simply by replacing the mechanical screw and the screw-bush with a 20 ton mechanical hydraulic screw. When using mechanical screws, much of the force is lost as a result of the friction caused by the thread. 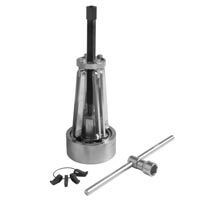 This mini-press administers a shock to the part which is to be extracted. 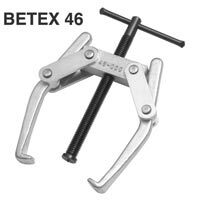 This enables optimal use to be made of BETEX pullers 52 and 54, without loss of force or wear and tear to screws. 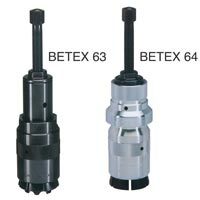 NOTE: For use with BETEX 54 Pullers TB-MP049200, TB-MP052230 and TB-MP054300 through 54600.